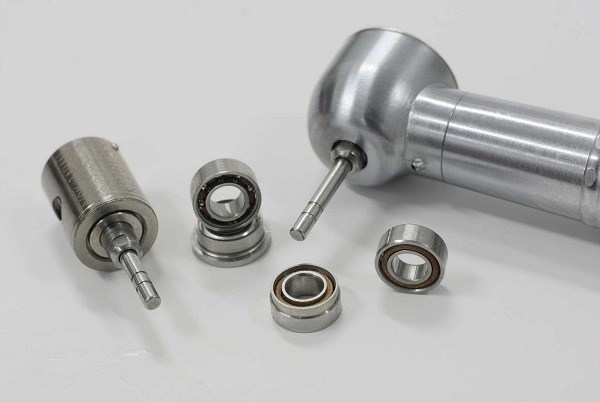 PYC bearing is a specialized manufacturer of dental bearing,dental handpiece bearings,dental bearing company,dental handpiece bearing,dental ball bearings,dental bearings,dental ball bearing. see the photoes of the high speed and slow speed samples. We have super precision miniature bearings for most dental/medical applications. These dental bearings are of the highest quality and precision with operational tolerances exceeding ABEC 9 (High speed instrument bearings). In addition to the standard lubricants we offer the Lube-No-More* grease pack to help minimize maintenance while ensuring long life. With advances in bearing design, dental hand piece bearings have evolved to give extended life and performance possibilities. With the increasingly economic options for ceramic components, many dental designs have ceramic elements although this is by no means the ultimate answer to all dental requirements. Alternatively click here to choose your bearing using our visual dental bearing selection guide. Meantime, we also supply the Slow Speed Dental Bearing to meet different customer's requirements. Using PYC dental bearings can make a real difference to the performance of your high speed handpiece. We've improved the material quality, surface finish and the design of the bearing shields to produce the most efficient dental bearing yet. You'll be pleased to know PYC's quality control procedures are as rigorous and tough as those used for the aerospace sector. Under usual circumstances, the main wear on a dental handpiece is just the bearing, so complete cartridges needn't be replaced at every service. And because of the longevity of PYC dental bearings, savings of hundreds of pounds can be made over the lifetime of your handpiece. PYC has developed a honing technique which improves the surface finish and the relative roundness of the bearing's inner and outer raceways, resulting in consistently higher speeds over the lifetime of the handpiece. Dental bearings operate in what must be one of the most extreme environments imaginable. Repeated sterilisation, loss of lubricant and the effects of operating debris often cause them to fail prematurely. PYC's product improvement and reliability programme enables handpiece manufacturers to significantly increase their warranties. PYC dental bearings can lower patient anxiety by reducing the noise generated by compressed air passing through the bearing. Using a compact, integral shield design and fine tolerances results in a much more comfortable operating mode. PYC dental bearings last up to four times longer than traditional bearings due to a unique combination of features. The bearings have a 60% smaller critical gap between the integral shield and the bearing inner ring compared to conventional designs. We've also improved the shield design to effectively retain lubricant, overcome the risk of shield ejection and prevent contamination from operating debris. The ceramic balls used in some PYC dental bearings are harder, lighter and more wear resistant than the steel versions used by other bearing manufacturers. Ceramic balls generate less centrifugal force at the high speeds dental handpieces operate, reducing wear on the bearing and the production of wear particles, which in turn increases lubricant life.